The KitchenTour 8.7 inches iced tea spoons with long handles crafted from superior 18/10 stainless steel which pass international highest standard food safety test and topped with a high-gloss mirror finish. Ergonomic handles rest comfortably in the hand, while high production standards ensure long-lasting performance and durability. And the simple and elegant design that will mix well with your existing flatware pieces. • Perfect to serve at any occasion! Extra-long spoons are perfect for reaching deep into frosty cold glasses of iced tea, lemonade and more, thoroughly stirring the contents for better flavor. QUALITY GUARANTEE: Made from SUPERIOR QUALITY 18/10 stainless steel. The combination of 18% chromium and the 10% nickel results in optimal corrosion resistance. LIFE STYLE: Working ends are modern, functional, and comfortable. Enjoy your Leisure times in summer. 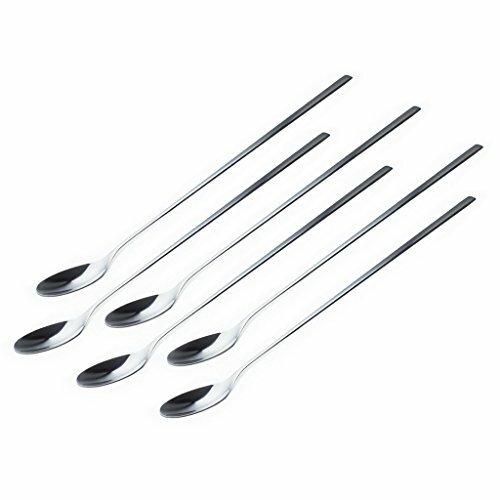 MULTIFUNCTION: Iced tea spoons with long handles suitable for mixing sugar or other sweeteners, eating ice cream especially floats and sundaes which is traditionally served in a tall glass. CLASSIC DESIGN: It is NICE that Kitchentour long tea spoons have no any specific decorative patterns, so they will fit in easily with any decor. ENVIRONMENT/HEALTH FRIENDLY: Easy to clean and Dishwasher-safe. Favorable length and weigh handle, harmless to health. Each spoon features our KitchenTour LOGO. 1 Year Warranty. If you have any questions about this product by KitchenTour, contact us by completing and submitting the form below. If you are looking for a specif part number, please include it with your message.